Did you know 75% of people who recently changed jobs used LinkedIn while making their next career decision? LinkedIn has evolved from primarily being a platform to update resumes to one for professional networking and personal branding. Savvy users tell their story in a way that encourages ongoing engagement with their online professional community through status updates, video, comments and viral views. They are building their audience through mutual connections and networking opportunities. 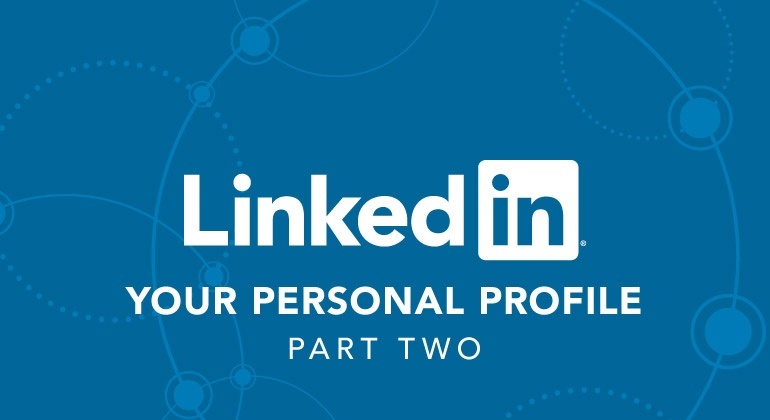 Here’s what you can do to improve your LinkedIn Personal Profile. 81% of U.S Americans have some kind of social media profile. Most profiles help individuals stay connected with friends and family, but LinkedIn is THE platform for professional networking. Just as recruiters use LinkedIn to find potential employees, you should be using LinkedIn to target specific referrals, prospect for your ideal buyers and connect with colleagues, customers, alumni and friends. Requesting to be connected with past or current colleagues and employers may lead to job or business opportunities. These individuals know you and their recommendations are seen as credible. Conversely, your endorsements and recommendations are also valuable to your colleagues’ networking opportunities, so return the favor and endorse others. You can use LinkedIn to search for specific positions or target certain companies. Employers are able to post job openings on their company profile. There are over three million active job listings on LinkedIn at any given time. Did you know that it’s estimated 85% of job openings are filled through networking? Personal profiles with unique and interesting content help add value and set you apart from the rest. Consider using these key strategies to improve your LinkedIn Profile. Choosing the right profile picture will help attract visitors and make a good first impression. Have someone take a photo of you with good lighting and a neutral background. Wear clothing that reflects the industry you’re in and crop the photo from just below the shoulders and to right above the head. Be memorable by writing a strong and engaging headline, using keywords related to specific jobs or industries. Make sure it has a benefit. Headlines are limited to 120 characters, which gives you room to say something meaningful. Don’t shortchange yourself. You should add at least five skills to give the viewer a better idea of your expertise and capabilities. Adding skills related to specific job titles will help you get noticed. Avoid adding general skills like “hard worker” and “people person“ which will not differentiate you from others. Did you know LinkedIn profiles with professional headshots get 14 times more profile views? LinkedIn profiles are a work in progress. They can never be completely finished because of the experiences and relationships gained over time. Some important areas to improve and update include resumes, jobs, skills and connections. Updating your resume online is much easier than updating the paper version. Online resumes quickly reach a larger audience. It is important to keep your resume updated to be prepared for new career opportunities. Posting new skills shows that you are active and interested in your industry and will give you an advantage over others. As your career grows, older positions aren’t as relevant. Updating the positions and titles you have held related to your field is very important to show your expertise. Be sure to include relevant metrics to prove your value. You’re always meeting new people, whether it’s colleagues, employers or people that you meet socially. Stay connected with these people and grow your network as much as possible. Did you know that 28% of LinkedIn members have up to 300 connections? LinkedIn profiles are a great way to connect with others and promote yourself. Remember to create your profile with your audience in mind and give them a sense of who you are, while leaving them curious about getting to know you personally. Give yourself a competitive edge and create an engaging LinkedIn profile today.